UPPSC Recruitment 2018: Uttar Pradesh Public Service Commission has issued official notification for 2437 vacancies of Allopathic Medical Officer, MO and other posts. Eligible and skilled candidates can send Uttar Pradesh Public Service Commission jobs 2018 application form through online mode from their official website uppsc.up.nic.in. Interested candidates can apply online for the UPPSC Allopathic Medical Officer, MO and other posts, vacancy is 2018 till 018-2018 till the last date. Candidates can download official notifications from the official website before applying for this vacancy. 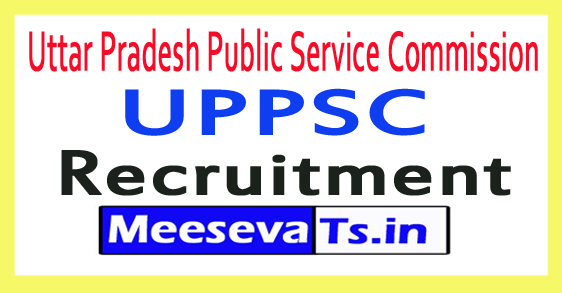 For more information about recruitment of Uttar Pradesh Public Service Commission, qualification details such as education qualification, age limit, selection process, application fees and how to apply, important links, courses, admission papers, results, eligibility details like previous papers, such as Are given below. Assistant Government Conveyor 01 Bachelor degree in law from University established by law in India or equivalent qualification recognized by the Government. Economic and Statistical Officer 04 Mathematical or Mathematical Statistics or Postgraduate Degree in Commerce or Economics or Statistics with at least fifty percent marks from the University established by law in India or the qualifications recognized by the government. Two year postgraduate diploma in statistics from the government recognized institution (Ii) Knowledge of Hindi in Devanagari script. Research Officer (Technical) 06 Mathematical or Mathematical Statistics or Postgraduate Degree in Commerce or Economics or Statistics with at least fifty percent marks from the University established by law in India or the qualifications recognized by the government. Veting Officer 01 Graduates in Art (as one of the subjects with English Literature or Hindi Literature) or Bachelor of Science or Bachelor of Commerce Degree recognized by the University established by law in India with at least fifty percent marks or qualification With three years of Bachelor's degree with at least fifty percent marks from the University established by the law of India with merit F is equivalent to law degree degree. (2) Diploma in the museum from the institution recognized by the government. Or two years of experience working in the prestige museum. Director's Reservation 01 (1) A Second Class Master's Degree in Indian Medieval History or with a Second Degree Accredited by the University with at least 55% marks in Ancient Indian History, Culture and Archeology, or established by law in India. (2) Diploma in archeology from the accredited archaeological institute and field experience of 5 years, including at least 2 years of service in central or state archaeological institutions or organization. (3) Experience of seven years in the field of central or state archaeological institutions or organizations with at least two years of service. Assistant Geophysicist 02 Master's Degree in Geology / Applied Geology that is provided by University established by Law in India with at least 50% marks in aggregate of Geology or Applied Geophysics or Master of Applied Geology. In case of the candidate should have physics and math for his B.Sc. degree. Allopathic Medical Officer Grade-1, 1954 MBBS, University degree recognized by the Medical Council of India Candidate holding a Post Graduate Degree / Diploma in Medical or Health Sciences in any particular subject of the university recognized by the Medical Council of India. Medical Officer 25 A Degree in Greek Tibb University, established by law in India. Or a five year degree or diploma in the Greek Tibb, of the Indian Medical Board. Lecturer IImul Advia 01 i) Five years degree from a university in Greek. ii) Postgraduate qualification of the subject from a recognized institution. Reader Tahfuji or Samji Tibb 01 i) Five years degree from the university established by law in Greek or five years degree from the Indian Medical Board, Uttar Pradesh. ii) Seven years of teaching experience in a recognized institution (five years for postgraduate). Hydraulics (Geology) 14 Graduate degrees in Geology Science have applied Geology Science with minimum 60% marks from the University established by law in India or equal to one degree recognized by the Government. Assistant geophysicist in Geological Science / Geology with minimum 60 percent marks in the University established by law in India or 10 degree equivalent to the degree recognized by the government. Assistant Director 4 Mathematical or Mathematical Statistics or Post Graduate Degree in Commerce or Economics or Statistics with at least 55% marks in the University established by law in India or with the qualifications recognized by the Government. Regional Tourist Officer / Publicity Officer 03 Equal to a degree or university recognized by law established by law in India, (b) Ability to read, write and interact in Hindi and English. Look around for "Allopathic Medical Officer, UPPSC Recruitment 2018 for MO and other postal posts". Look for "Recruiting UPPSC 2018 for Forest Officer Positions". The selected candidates will receive rules of the organization according to the UPPSC. Search "Recruitment of UPPSC 2018 for PCS Publications". Department of Culture of U.P. Department of Food and Drug Administration. Above. Above. Chikitsa Shiksha (Unani) Dept. Look for "UPPSC 2018 Recruitment for Drug Examiners, Medical Officer, Teacher Publications". UPPSC Recruitment 2018: The Uttar Pradesh Public Service Commission has launched a UPPSC Jobs Notification for 465 posts of Samiksha Adhikari/ Sahayak Samiksha Adhikari. Skilled and talented applicants can check the details of latest Uttar Pradesh PSC Recruitment 2018. Candidates can Apply Online UPPSC Vacancy 2018 from legitimate internet site @ uppsc.Up.Nic.In. Aspirants can submit an utility on or earlier than the final date i.E. 30th January 2018. You can check the alternative information of UPPSC Samiksha Adhikari Recruitment 2018 beneath in this post along with Eligibility Criteria, Important Dates, Application Process, Application Fee, Selection Process, Admit Card, Result, Etc. Uttar Pradesh PSC has invited the eligible applicants to fill vacant posts of Samiksha Adhikari/ Sahayak Samiksha Adhikari. Candidates who're looking for contemporary jobs in Uttar Pradesh the ones can apply for UPPSC Vacancy 2018 by way of on line mode on or earlier than the due date. Interested candidates can get entire information with the aid of reading the below-given publish. About UPPSC: The Uttar Pradesh Public Service Commission which is also called UPPSC installed on April 1st, 1937 in India. UPPSC become created by means of the Constitution of India under Articles 315 to 323 by means of the imperative authorities. UPPSC takes the entire civil service exam for the selection of numerous posts in Uttar Pradesh State. Its number one feature is to recruit candidates for numerous positions in the authorities departments of the state. Uttar Pradesh government regulates UPPSC. The UPPSC has released the UPPSC Jobs Notification 2018 for 465 Samiksha Adhikari/ Sahayak Samiksha Adhikari posts. You need to check the complete information earlier than filling the software form. Candidates must sign up through on-line mode on or earlier than the remaining date. The professional notification was released on date twenty eighth December 2017 and aspirants can publish the utility shape until closing date thirtieth January 2018. Search the Online Jobs Application shape link on home web page and open it. Read the commands and start to fill utility. Fill whole form by means of correct statistics. Upload the test copies of asked documents. Recheck shape and hit on put up key. Take a reproduction of the carried out shape and pay charge. Candidates will get the selection with the aid of performance in written exam and interview round. You should make the make the minimum rating in the examination same to the cutoff marks. So fill the software and take part in a written exam with proper training for buying excessive marks. The UPPSC Exam Admit Card 2018 may be provided online on the respectable internet site earlier than 2 weeks the exam date. Aspirants can collect it by way of registered id and password. The name letter of the exam could be furnished handiest for the eligible candidates who will post the software on or earlier than the closing date. You need to examine the commands of an examination and comply with them on the examination centre in any other case you can should prevent to participate in the exam. The UPPSC Result 2018 will be launched on line on the legit website soon after whole the choice system. Candidates will get the advantage listing of the examination through call & roll wide variety of the exam. The final advantage list may be uploaded to the authentic portal. You can live with us for upcoming Sarkari Results. We have provided here all details of UPPSC Recruitment 2018 and we are hoping it will be helpful for you. Aspirants can submit an utility for Samiksha Adhikari posts on or earlier than the ultimate date. If you have got any questions Related to UPPSC Vacancy 2018. UPPSC Recruitment 2018: Uttar Pradesh Public Service Commission goes to behavior Combined State/ Upper Subordinate Services Examination- 2018. The Commission has invited applications for UPPSC Jobs 2018 for filling of 251 vacant posts through Combined State/Upper Subordinate Services Examination. Candidates are advised to Apply Online for UPPSC Combined State Service examination 2018 via the legit website @uppsc.Up.Nic.In. The Last date to use for the Uttar Pradesh PSC Jobs is up to date soon. For extra info which include the way to follow, selection manner, and many others. Are given underneath. Educational Qualification: Candidate must have Bachelor degree from any properly-recognized college/ board or equal qualification as much as the closing date. Age Limit: Candidates age ought to have the minimal age of 21 and maximum age of 40 years as on 1/07/2018. Interested candidates can practice for UPPSC Upper Subordinate Vacancy 2018 by way of online mode via the respectable internet site. Applicants need to add the relevant files along side utility form. Applicants have to read the unique UPPSC Notification 2018 cautiously earlier than applying. Also, you have to keep in thoughts the closing date to use. Here we are presenting a few steps for candidates to use in an easy way. Firstly, go to the legit site @uppsc.Up.Nic.In. Click on the UPPSC Recruitment link within the news section. Fill the correct information in UPPSC Online Application shape. Pay application charge thru on-line technique. Click on Submit utility shape button. Take the printout of the software form for destiny references. Application Fees: Applicants ought to pay the software fee thru the E-challan. Any other mode will now not accept instead of E-Challan. The Fee information for categories wise is as follows. The Competitive examination contain 3 successive levels i.E. (I) Preliminary Examination (Objective Type & Multiple Choice). 2- Main Examination (Conventional type i.E Written examination). 3- Viva-Voce (Personality Test). The prelims examination will encompass two compulsory papers of which answer sheet be on OMR Sheets. The papers shall be two hundred marks each and of hours duration. Both the papers will be goal kind & multiple desire in which there shall be 150-a hundred questions respectively. The timing of paper-I will be from nine.30 to 11.30 am and paper-II from 2.30 to 4.30 pm. Note: Paper-II of the Preliminary Examination may be a qualifying paper with minimal qualifying marks fixed at 33%. (2) It is obligatory for the Candidates to appear in both the papers of Preliminary Examination for the purpose of assessment. Therefore a candidate will be disqualified in case he does not appear in each in papers. (3) The benefit of the Candidates will be decided on the premise of marks received in Paper-I of the Preliminary Examination. Subjects for the Main (Written) Examination: The Written examination will include the subsequent obligatory and elective subjects. The candidates must pick out any two subjects from the listing of non-obligatory topics for foremost examination. Each elective concern will include papers. Result 2018: The Final UPPSC Result 2018 could be Declare on the legit website after the accomplishment of the selection procedure via the authorities of Uttar Pradesh Public Service Commission. All the applicants are notified to read the full declaration earlier than making use of for the UPPSC Recruitment 2018 through the official internet site. All the records available on this website for Uttar Pradesh PSC emptiness 2018 is accurate and obtained from the professional notification. But within the case of any question kindly remark underneath. Our group will respond to your remark very soon. 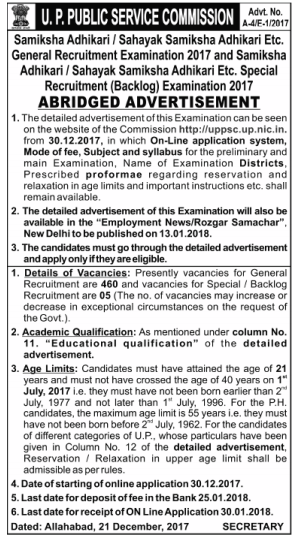 UPPSC Recruitment 2017: The Uttar Pradesh Public Service Commission has launched a UPPSC Jobs Notification for 765 Vacancy posts of Lecturer & Professor. Candidates can Apply Online UPPSC Vacancy 2017 from reputable internet site @ uppsc.Up.Nic.In. Aspirants can publish an utility on or before the remaining date i.E. Twenty fourth November 2017. You can take a look at the opposite details of UPPSC Lecturer Recruitment 2017 below on this post which include Eligibility Criteria, Important Dates, Application Process, Application Fee, Selection Process, Admit Card, Result, Etc. About UPPSC: The Uttar Pradesh Public Service Commission which is also called UPPSC hooked up on April 1st, 1937 in India. UPPSC became created by means of the Constitution of India underneath Articles 315 to 323 by using the principal authorities. UPPSC takes the whole civil provider examination for the selection of numerous posts in Uttar Pradesh State. Its number one feature is to recruit candidates for diverse positions inside the government departments of the country. Uttar Pradesh government regulates UPPSC. The UPPSC has launched the UPPSC Jobs Notification 2017 for 765 Lecturer & Professor posts. Candidates who're seeking out the modern-day teaching jobs those can observe for UPPSC Lecturer Vacancy 2017. You want to test the entire data before filling the software form. Candidates should sign in by on-line mode on or before the ultimate date i.E. 24th November 2017. Qualification: Aspirants want to have a post commencement diploma from the recognized college of education in applicable filed. For more details refer legit notification. Age Limit: The age of candidates must be between 21 to forty five years at the closing date to use. Age rest for the reserved class candidates could be provided in line with the recruitment policies. Search the Online UPPSC Recruitment Application shape hyperlink on home page and open it. Read the instructions and begin to fill application. Fill whole form via accurate data. Upload the test copies of requested documents. Recheck shape and hit on publish key. Take a copy of applied form and pay charge. Application Fee: Aspirants will pay the software price by online mode of bills through debit card, credit card & internet Banking in step with the category. Selection Process: Candidates gets the choice through performance in written exam and interview spherical. You ought to make the make the minimal rating inside the exam same to the cutoff marks. Admit Card: The UPPSC Exam Admit Card 2017 might be furnished on line on the professional internet site earlier than 2 weeks the exam date. Aspirants can collect it via registered identity and password. The call letter of the exam could be supplied most effective for the eligible applicants who will put up the application on or earlier than the ultimate date. Result: The UPPSC result 2017 will be launched on line at the reliable internet site soon after complete the selection manner. Candidates will get the advantage list of the exam via call & roll quantity of the exam. We have supplied right here all details of UPPSC Recruitment 2017 and we hope it'll be helpful for you. Aspirants can put up an application for Lecturer, Professor posts on or before the final date. If you have got any questions Related to UPPSC Vacancy 2017 then ask us by remark our professionals will respond you as soon as feasible.